You might be fooled into thinking the game would take the easy route – a simple business sim filled with 420blazeit jokes – but Weedcraft Inc. smartly saves these cheap gags for the Steam achievements, and nothing else. It sets out to tell two fairly serious stories – one of an MBA dropout who decides to assist his unemployed brother with some cannabis plants for some quick change, and another of an ex-felon who winds up growing the drug to support his now free lifestyle. Both are concerned with the social determinants of crime, and do not give easy answers or squander their emotional weight for a cheap laugh. Over the course of the (very long!) campaigns, you’ll get to know a colourful cast of characters, make allegiances and rivalries, and have your moral codes questioned. You would also be wrong if you thought Weedcraft Inc. would follow in the footsteps of other “anti-tycoon” games such as Jurassic World Evolution or No Pineapple Left Behind – games which deliberately mislead the player into making terrible mistakes in order to criticise the systems of power which makes becoming a tycoon so difficult. Make no mistakes, Weedcraft Inc. is a serious business management game: you’ll hire employees, deal with fluctuating consumer demand, and apply a variety of long term and short-term plans to ensure that your product stays out on top. The first campaign is effectively a long tutorial which just keeps introducing mechanic after mechanic, long after you’d have thought would be the developers’ limit. The second campaign then puts all these learned skills to the test, and practically mandates a well-planned approach for any semblance of success. There are definitely still mechanics which are borderline tedious, but there’s lots of fun to be had in the game’s strategic depth, and figuring out the best way to maximise your profits from both a production and a sales perspective. Just booting up the game itself, you’ll see that the artwork is absolutely gorgeous. It’s a comic-book style with distinctive colours and very expressive faces, which suits the game’s character driven narrative to a T. It’s wonderful that the developers have given the players something nice to look at, because this game does boil down to a series of icons and menus. The artwork keeps everything lighthearted, even when the business simulation side of things gets dicey. It’s complemented by a bouncy lo-fi hip hop soundtrack that just seems appropriate for the kind of work you’ll be doing. 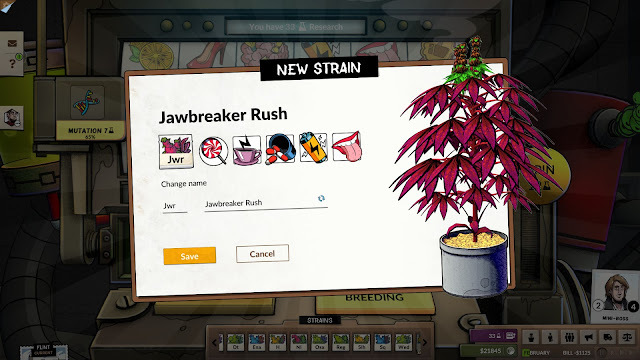 There seems to be a certain respect on the part of the developers of the challenge and complexity of the marijuana trade, which might be something that many players overlook. I admit I generally think of it as just a narcotic – and it’s this same view which is taken by the general public and law enforcement. It is only those who have partaken in recreational use for a long time, who would be able to differentiate between strains, quality, soil. Temperature, lighting, nutrients and the myriad other variables which determine whether your product is any good or not. Growing is handled with a timing based minigame which will have you watering and pruning plants on queue. Players will slowly learn additional tricks to improve the quality of their product – and it’ll be necessary, since it’s a competitive market out there, and the road to success is narrow. 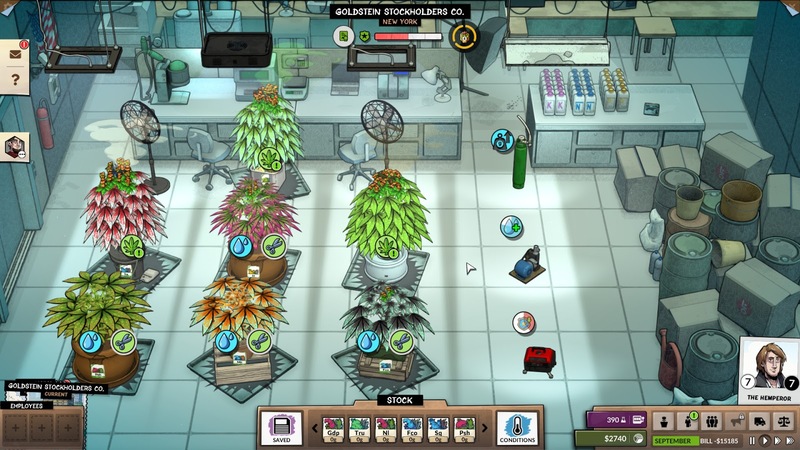 While the planting and business management is complex and strict, it’s in the game’s portrayal of marijuana’s legality which allows for some more creative interpretation. The game practically goads players into taking a stance on how legal or illegal they wish to be – although it also never imposes a particular viewpoint that one is better than the other. At the risk of getting too political, it’s well known that America’s treatment of cannabis (especially with regards to the War on Drugs, and the targeted crackdowns on recreational use to certain social groups) has been heavy handed. It would have been easy for Weedcraft to take the definite stance that unfair laws are meant to be broken – but like everything else, this game takes a turn for the complex. You’re able to unlock perks to various points of your manufacturing chain based on legal or illegal means, and spec-ing deeper into each tree unlocks more impactful bonuses. Much of the game is about riding the line between legality and underhanded deals, and it uses the current US political climate to its advantage. Medicinal and recreational use will be legal in some states and illegal in others, and the player is able to exploit these for price differences to get an edge over competitors. The game always lets you know the risk of getting caught if you do choose to break the law, but never does it suggest that doing so is morally wrong or morally justified. 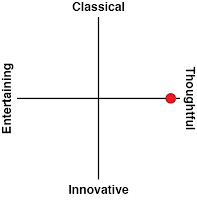 It’s up to the player to decide, through their expressive play style. Through all of this discourse Weedcraft Inc. sheds more light on the dubious nature of capitalist systems, especially in relation to illicit products such as marijuana. 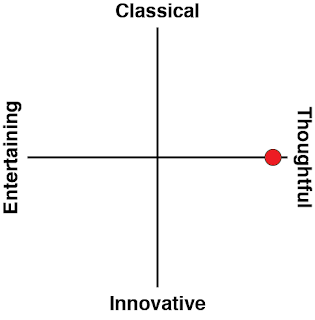 It’s very difficult to argue that the player isn’t co-opting in a legitimate business venture: they’re using their own funds, they’re performing immense acts of skill and care in growing their product, and they are tasked with developing increasingly savvy tactics for business to keep customers close and competitors at bay. 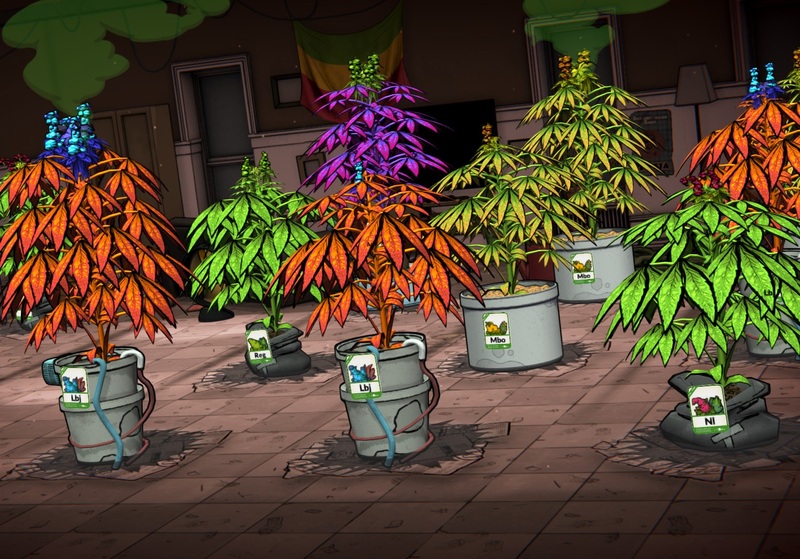 There’s lots to learn about running a legitimate business through Weedcraft Inc.’s gameplay. Couple that with the two protagonists’ various circumstances which would absolutely prohibit them from breaking into a more reputable industry and you can start to understand how the narrative of this game falls into place. This isn’t a game which cracks easy jokes about weed culture; it doesn’t underestimate the finesse involved in the craft; but it also doesn’t shy away from criticising the shadier aspects of the industry either. It’s a truly fascinating look into a mythologised trade, and it’ll be a test for the most seasoned of tycoon fans.